This year, re-souL will partner with Skate Like a Girl for Ballard Gives Black Friday and we are pledging a percentage of our sales for Friday November 28th to the organization. We’re guessing very few readers know that re-souL co-owner Legh is a life-long skateboarder and 2 years ago founded the Ballard Thrashers Skateboard Club as a way to keep his son and all the friends together during the summer months. After 2 full summers of Saturday Skateboard Club, in 2014 Legh partnered with a local non-profit Skate Like a Girl to produce an after school skateboard team for kids. 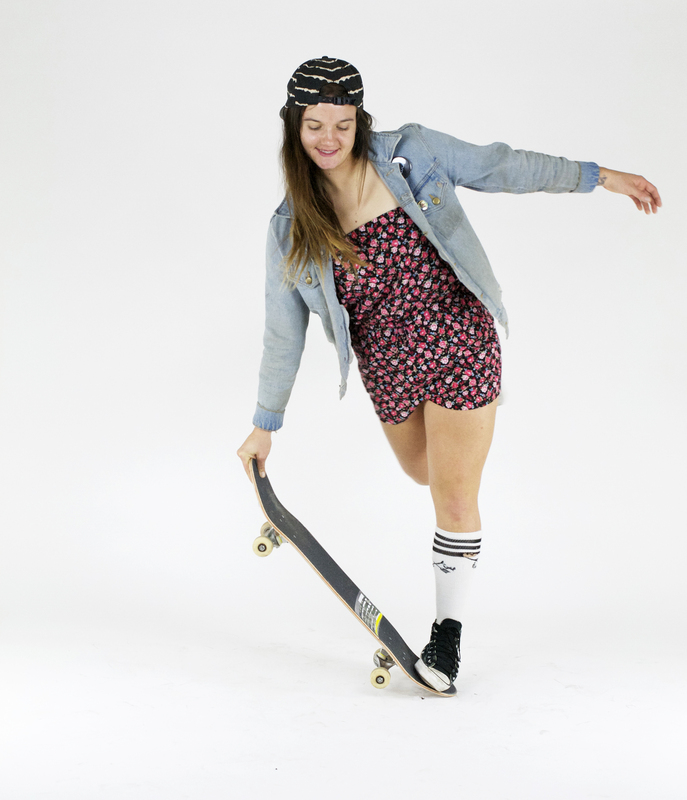 This connection brought professional skateboarder Kristin Ebeling on as skate coach as well as a team of certified skateboard instructors to help the Ballard Thrashers take their skills to a whole new level. Kristin’s skate coaching philosophy focuses not only on tricks and skills, but values such as leadership, teamwork and sportsmanship. We’d like to recognize them not only for their talent as an organization but also as individuals. We think they’re rad. 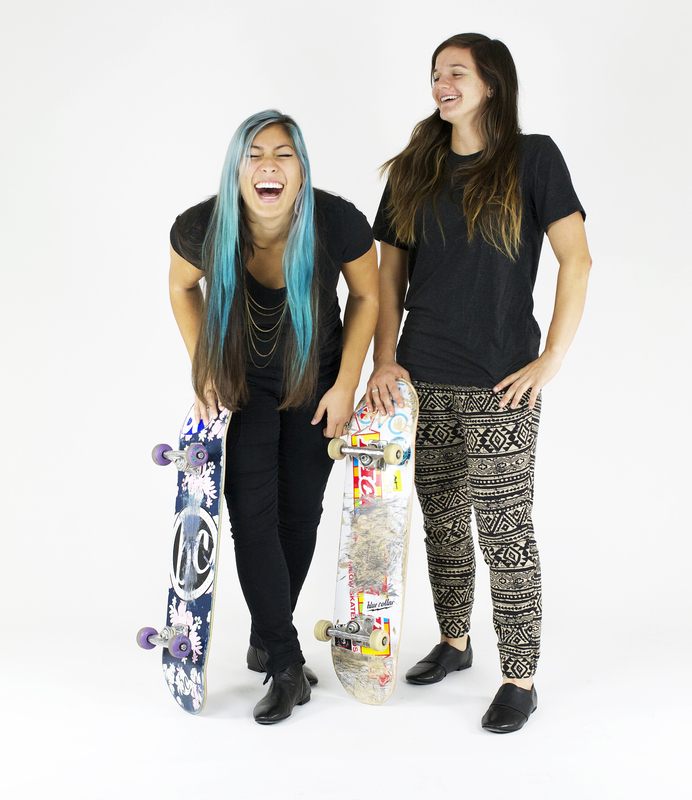 So let us introduce you to Skate Like a Girl superstars Kristin Ebeling and Jasmin Kwan. 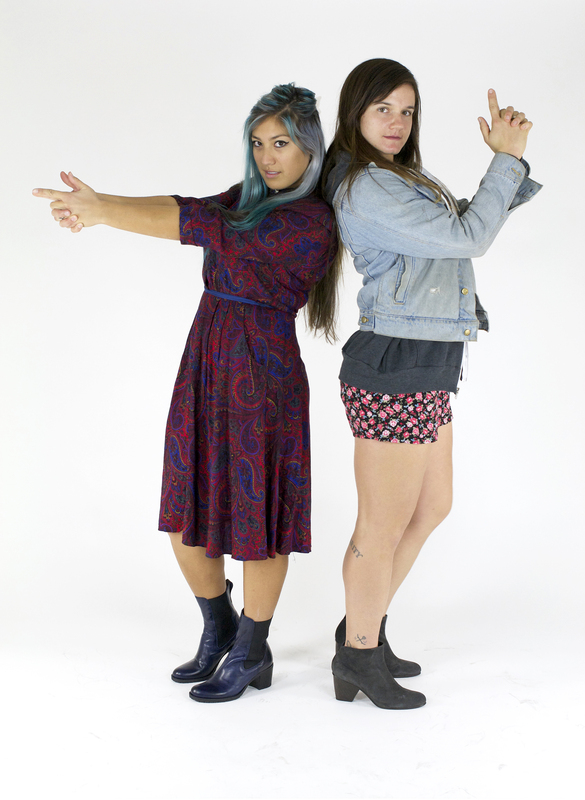 Jasmin Kwan and Kristin Ebeling wearing boots and shoes from Kudeta. Favorite Food: Anything (our friend) Marshall or my mom makes! Sponsors: Nancy Chang (our board chair) telling me I can do whatever I want. Favorite Food: Tater tots or Indian buffet. How long have you been skateboarding and how did you get started? JK: I first started when I was about 15, but I was also a competitive gymnast – I had to lie about how I got hurt (while skating). And basically had to hide it, as if it were a sketchy boyfriend or something. So I pretty much took a hiatus from 16 to 23 years old. KE: I started at age 12. I played football with the boys at recess, so naturally when they picked up skateboards, I did too. I was also inspired by Elissa Steamer’s character on the Tony Hawk’s pro skater video games. I thought, “if she’s skating, so can I.” I liked that she wasn’t too girly. I could relate to that. How did you get connected to the Skate Like a Girl organization? KE: I “met” Skate Like a Girl when I was 17. I heard about an all girls skate competition they were throwing, so I decided to check it out. At that point I was an accomplished skater of 5 years, but hadn’t really skated with another gal before. My jaw dropped as I saw a girl ollie the 8 stair when I walked up. Beyond that, I was stoked to see a woman (Nancy Chang) on the microphone announcing, as well as other ladies filming and taking photos. I was so inspired by the energy, I decided I wanted to be a part of the crew immediately. From that point, I began volunteering at clinics and events. The rest is history! 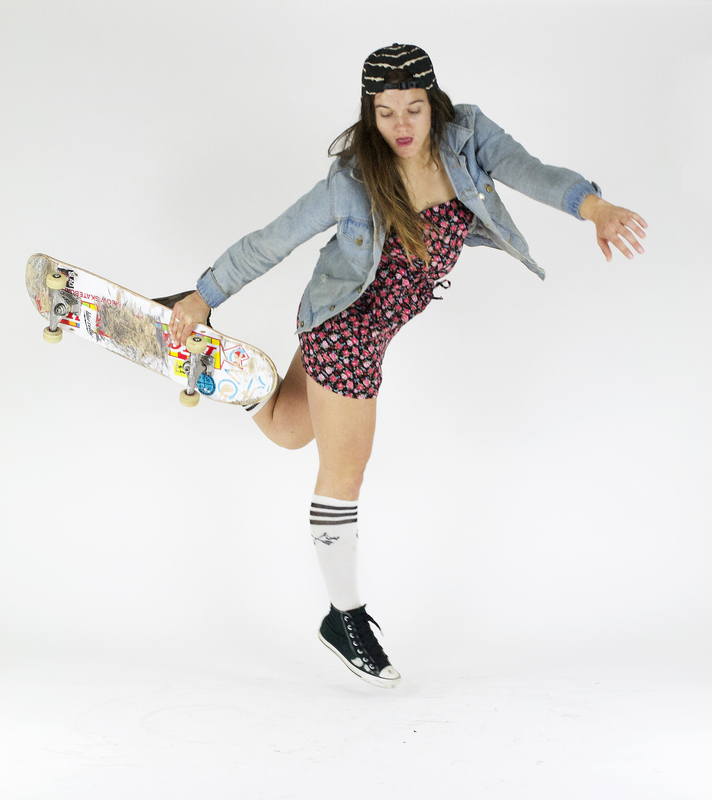 Can you tell us in your own words what Skate Like a Girl represents to you? JK: Skate Like a Girl represents a revolution happening in skateboarding culture. We’re moving away from the male-dominated, ‘skate as wild as you can’ scene, and towards a more diverse demographic. We have moms wanting to learn how to skate because their kids are doing it – that pretty much speaks for itself. We are changing the stigmas that come with doing something ‘like a girl,’ and I love that. KE: Skate Like a Girl represents the future of skateboarding. We are constantly pushing the “norms” of who can participate in skateboarding, and how people learn to skate. Where do you think Skate Like a Girl is going? 5 years? 10 years? JK: My utopian vision is to have our own covered skate space with a foam pit! Realistically though, capacity building in our existing chapters and expanding to different cities nationwide (or worldwide). I really believe that we are changing skateboarding culture in our communities and in the media – people will start to connect our mission with the changes they’re seeing in the coming years. KE: Skate Like a Girl is going in whatever direction is needed from our local communities. We essentially build our programs based off of people saying, “hey this would be a good idea.” My personal hope is that we can open up our own all-weather skate facility and create a youth skateboarding league within the next 5 years. Within the next 10 years, I would hope we could expand to some new cities, while continuing to create gender equity within skateboarding. It would be great to be able to say that 50% of all skaters in Seattle are female. This would not only be rad to me personally, but would allow for tremendous growth for our local skate shops & other businesses. KE: I’m going to have to go with Lacey Baker. She – hands down – has the best style, and is such a humble person as well. 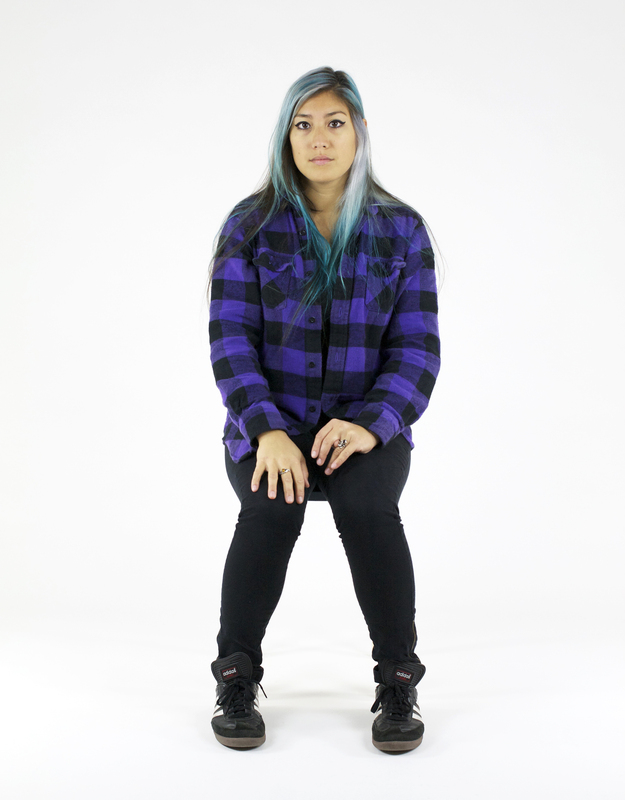 She also has a degree in graphic design and has done some rad work for Meow Skateboards. Oh yeah, she won x games this past summer. So, when you’re not skateboarding, tell us about a favorite outfit you like to rock, what’s your style? JK: I’d say it’s pretty country Western Mad Max meets 70s glam with lazy punk rock boarder chick accents. My favorite ‘fancy’ outfit at the moment is my 70s blue/purple paisley shirt dress with grape colored Jeffrey Campbell Litas. 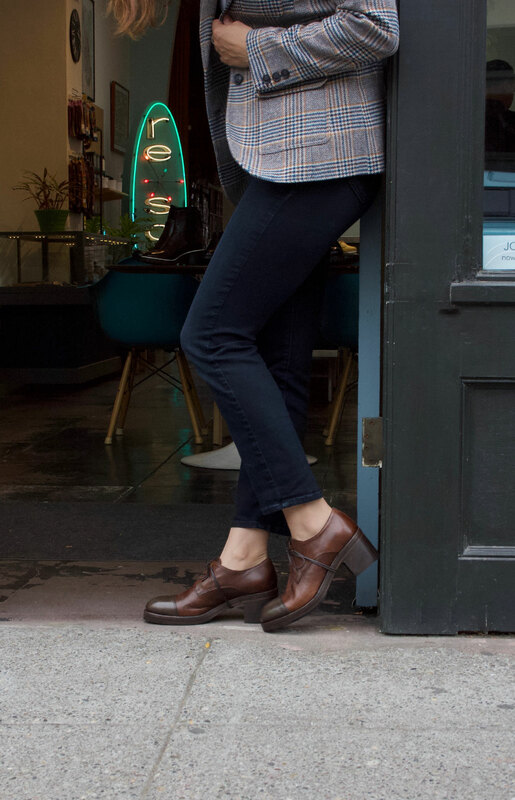 Top that with a faux fur coat OR black motorcycle jacket to break the cold Seattle breeze. My hair also happens to be a random bright color at any given moment. KE: I’ve been really into jumpers & floral print lately. I would describe my style as basically taking one feminine piece, like a jumper or dress, then throwing in a punk/skate inspired jacket, along with some badass boots or beat up converse. I also throw a little flare with a five panel hat, and some vintage inspired jewelry. JK: My helmet is orange, but I am not afraid of some HOT pink. KE: Orange, Go [Ballard] THRASHERS! JK: Antique malls and craft beer. KE: Thrift stores & dive bars. Tony Hawk or Tony Alva?